There are literally hundreds of suppliers of natural stone products in the UK, from small one man bands to large organisations, all looking to supply products that to the naked-eye appear very similar. This can make comparing all of our products at Stonemarket to everything else a complex and time consuming issue. But understanding the differences in the types of natural stone available is important, especially if the reputation of your business depends on it. Not all natural stone is suitable for use as external paving, so a British Standard was put in place to help guide those looking to buy paving products in the UK. All of the natural stone you see in the Stonemarket brochure has undergone testing to ensure its suitability as paving; the testing done at our own in-house lab and also from petrographic testing carried out by a UK based third party auditor called Sandberg is used to obtain CE Certificates or a Declaration of Performance document. Ask to see the CE Certificate or Declaration of Performance document or laboratory test reports for the stone you are considering buying, pay particular interest to the Water Absorption, Frost resistance and Flexural Strength results as these will tell you a lot about the product. At Stonemarket we have tried to make the buying experience easier for you by introducing the Stone Standard. The Stonemarket Stone Standard has been designed especially for our sandstone products and focuses on the Water Absorption, Frost Resistance and Flexural Strength results; the reason for this is because our sandstone products are frequently compared to look-a-like products on the market. This doesn’t mean the rest of Stonemarket’s natural stone products aren’t tested to ensure they meet any relevant standards, but we have gone a step further to ensure our sandstone products meet even stricter standards than those set out in European standards and the British Standard BSEN; 1341. To meet the Stonemarket Stone Standard our Sandstones must have a water absorbency of no more than 1.7%. Water Absorption is measured as a percentage and is the ability of the stone to absorb water. In the case of the water absorption test, the lower the water absorption percentage the better, the higher the % values the more absorbent that material will be. Why is it important to consider the Water Absorption of the stone you are installing? Firstly natural stone is composed of a variety of minerals, some of which are not chemically stable and can become reactive when they are in contact with water and oxygen. The most common is the oxidation of iron which can potentially result in staining on the product. Secondly, stone with high water absorption takes in more water, like a sponge, making it stay wet for longer which encourages the growth of algae and the entrapment of dirt. We do not recommend that our sandstone needs to be sealed; this is because our range of sandstones have such low water absorption. This means our sandstones shouldn’t need to be cleaned as often as those with a high water absorption percentage – this said any product which is installed outside will require a certain amount of maintenance but this shouldn’t be more than a clean with a power washer once or twice a year. If a supplier recommends their stone needs to be sealed it may be because the water absorption is so high that the product will go green with algae growth within weeks of installation and by sealing it will hide the poor performance of the stone. It is also important to remember that if a stone has a high water percentage then the stone you are working with is probably a softer stone. Softer stones are easier to cut and process in the quarries and factories they are sourced from which keeps manufacturing costs down , this price saving is then usually reflected in the price we see in the UK. Stones with low water absorption are usually harder, denser stones making them a better quality stone but this means they take longer to cut and process in the quarries and factories they are sourced from, this then results in a higher selling price in the UK. To understand the frost resistance of a natural stone we subject it to a ‘Freeze/Thaw’ test in a laboratory. The frost resistance of a stone is calculated by testing the strength of the stone and then putting it into equipment that will freeze it and thaw it 56 times; the stones strength is then retested. If the strength of the stone is more than 90% of the original value it is deemed to be acceptable otherwise it is considered not to be frost resistant and not strong enough to withstand a prolonged and harsh British winter. In addition to the laboratory testing, we also install all of our new stone products over at least one winter prior to it being launched. This means we have the laboratory test results and in-situ testing observations to go from when we are making the call on whether or not a stone is fit for the Stonemarket range. Why is it important to consider the frost resistance of the stone you are installing? We can all be blinded by the beauty of natural stone paving when it is displayed at show centres or featured in glossy magazines, but choosing a natural stone paving which hasn’t been tested for suitability in the harsh British climate can leave people with a product which looks a million years away from the paving they first fell in love with. Natural stone paving products can start out life as a slab of stone quarried from almost any country in the world, but not all of the countries these paving products come from experience the same type of climate as we do here in the UK, so while one type of stone may work as a paving in countries which experience warmer temperatures all year round it may fail as a paving in the UK after just one winter. 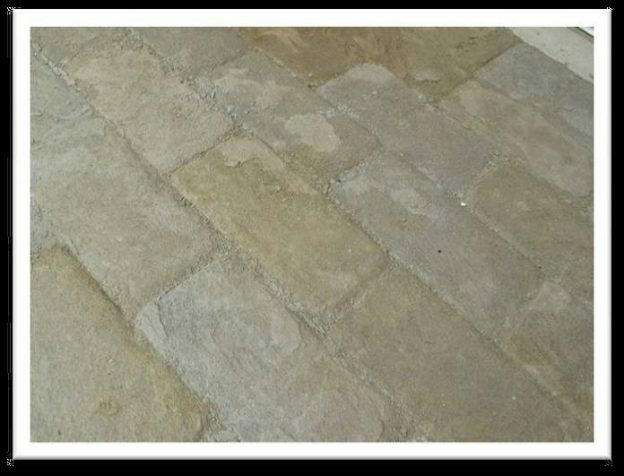 Anybody buying sandstone paving from our range can have complete confidence that our products meet our own very strict Stone Standards when it comes to frost resistance. This means the customer shouldn’t be left with stone which delaminates due to the freezing temperatures we experience here in the UK. Image shows natural stone setts which have been affected by frost damage leaving the surface of the setts eroded. To meet the flexural strength requirements of the Stonemarket Stone Standard all of our Sandstones will have a flexural strength of no less than 12.9Mpa. In the case of flexural strength the higher the Mpa number the stronger the stone is. Mpa stands for Megapascal; Megapascal is a metric pressure unit and how flexural strength is measured. 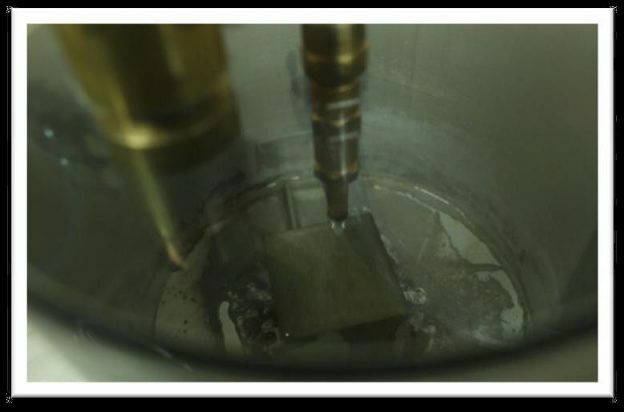 As well as performing flexural strength tests in laboratories on our natural stone products we also use our in-situ testing as a way of understanding how the product performs during and after installation. Why is it important to consider the flexural strength of the stone you are installing? The flexural strength of a stone determines how likely the stone is to breaking during installation or once in-situ. There are different kinds of loading in different settings, i.e. people, cars, vans, lorries etc, but we need to ensure our natural stone products are suitable for the intended domestic application. Customers who buy and install our stone can have complete confidence that our sandstone products meet our own very strict Stone Standards when it comes to flexural strength. This means the product should be able to withstand the installation process and perform once in-situ leaving the homeowner with a patio they can enjoy for years to come. 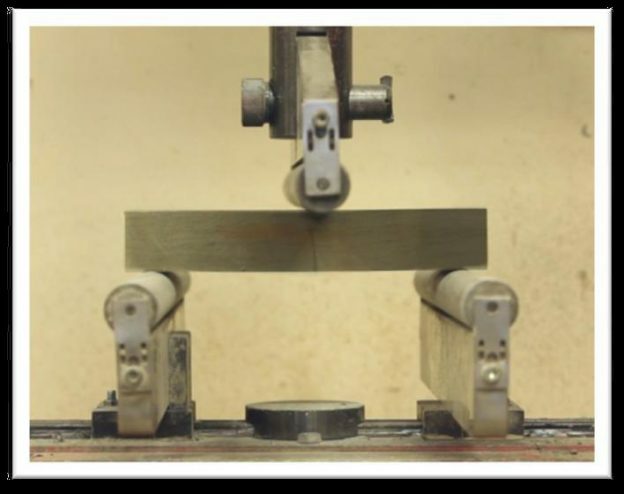 Image shows a piece of natural stone been subjected to the flexural strength test in a laboratory. Flexural Strength is measured by supporting a piece of stone on 2 beams and applying a downward force in the middle. The downward force, measured in Megapascals (Mpa), is the force at which the slab breaks. So don’t forget, check the test data of the stone you want to buy. Buy from a reputable dealer, if they can’t provide the CE Certificate, Declaration of Performance Document or laboratory test reports don’t buy the product, your reputation as a designer is on the line, or, as a homeowner, your significant investment can devalue quickly. We hope this helps you better understand the Stonemarket Stone Standard and why we felt the need to introduce it. We are proud of the stone we supply and want our products to be enjoyed by all of those who chose to use them. If you have any questions regarding the Stonemarket Stone Standard please do not hesitate to contact us on 0345 302 0603, our team will be more than happy to help. Stonemarket, for complete confidence in the stone you choose.